Funnville - The Richmond Flying Squirrels, Double-A affiliate of the San Francisco Giants, are excited to announce the four season-ending award winners for the 2018 team. The awards were handed out between games of Sunday's doubleheader at The Diamond. Awards are given for four separate categories of excellence: Team Most Valuable Player, Pitcher of the Year, Puritan Cleaners Dirty Squirrel of the Year and the Community Service Award. Howard earns the Flying Squirrels MVP Award in his first season at the Double-A level. The 24-year old middle infielder ranks third in the Eastern League in doubles (32) and currently leads the team in hits (111). Howard was named a mid-season Eastern League All-Star for the Western Division and has played both shortstop and second base for Richmond. The former University of Missouri standout has been with the Flying Squirrels since the beginning of the season and has committed just 17 errors in 113 games played. Howard's 32 doubles are tied for fifth-most for a Flying Squirrels player in a single season. Previous team MVP award-winners include Miguel Gomez (2017), Hunter Cole (2016) and Rando Moreno (2015). McNamara has appeared in 32 games for Richmond and has posted a 1.24 ERA with seven saves. The mid-season Eastern League All-Star has not allowed an earned run in his last 18.1 Innings pitched, a stretch spanning 13 appearances. A native of Staten Island. McNaMara joined the San Francisco Giants organization from the New York Yankees on July 23, 2017 in exchange for cash considerations. McNamara was initially selected by the Yankees in the 27th round in the 2013 draft out of Adelphi University. His 1.24 ERA is the lowest in franchise history for a reliver with more than 30 innings pitched. McNamara appeared in eight games last season with Richmond and made six starts down the stretch after coming over in the trade from New York. Slania has been a mainstay for the Flying Squirrels within the Richmond community since his Double-A debut in 2014. The University of Notre Dame product has made over 100 community appearances in his tenure with the Flying Squirrels, including over 30 this year alone. Slania's community work includes visits to the Children's Hospital of Richmond at VCU as well as FeedMore. Slania has also made numerous stops at local schools, little leagues and Flying Squirrels baseball camps. In addition to his hard work off the field, Slania has once again thrived out of the Flying Squirrels bullpen. The burly right-hander was also named to the mid-season Eastern League All-Star team and has posted a 2.51 ERA. Slania has punched out 65 batters in 68 innings pitched. The former fifth round selection made his Major League debut with San Francisco on June 30, 2017. The organization would like to acknowledge all the members of the Flying Squirrels team for being involved with the club's community efforts in the region. Additionally, left-handed pitcher Garrett Williams also receives an honorable mention for the award for his outstanding work in the field. The Puritan Cleaners Dirtiest Squirrel of the Year is awarded to the player who has accrued the most Dirty Squirrel of the Game honors - given each home game to the player that has sullied their clothing in the name of hustle and hard-nosed playing. 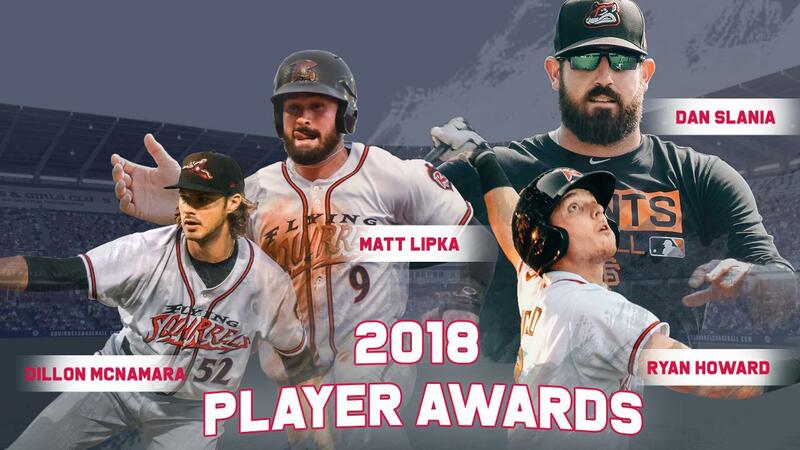 Matt Lipka takes home the award in his first season with the Flying Squirrels. The Atlanta Braves former first-round selection (35th overall) muddied his uniform on a nightly basis at The Diamond while primarily playing centerfield. Lipka leads the Flying Squirrels with 20 stolen bases and is tied for first on the team with ten outfield assists.